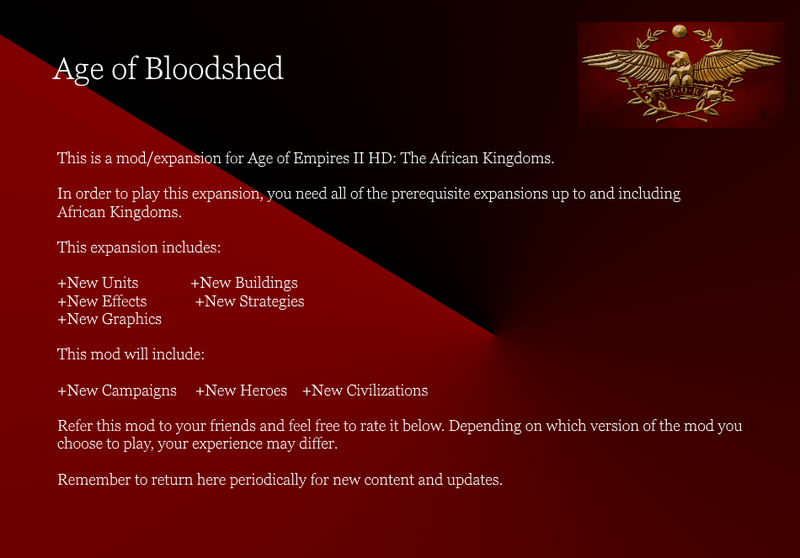 You need Age of Empires II HD: The African Kingdoms to play the Age of Bloodshed expansion. more health and move slightly faster. Will properly receive all Monastery upgrades. -Attack Dog added to Town Center. Uses the "Wolf" animations. -War Hero now characterized and recognized by the code as "Swordsman" instead of "Town Center". of the unique naval units. -Legionary now classed as "Swordsman" and the info text will no longer read "Town Center". -Merciless Savage classed as "Archer" and the info text will no longer read "Town Center". -Death Knight classed as "Cavalry" and the info text will no longer read "Town Center". -Gladiator Siege Tower correctly classed. Info text will now say "Siege Tower", not "Town Center". -Siege unit added to Imperial Palace. Every castle needs siege weapon options. This new unit is the "Imperial Tower". -Colosseum will now be classed as "Barracks". Info text will no longer read "Town Center". -Sea Fortification added to Shipyard on the 2nd page as button 34. Bottom right. Enables on research to Feudal Age. You click the button, a construction pad is placed and you send a villager to work it. -Legendary Witch and Legendary Jarl correctly classified under ranged units. Info text will read "Skirmisher" instead of "Town Center". -Amphibious Raider Craft icon and graphics changed. -Legendary Witch Icon and Graphics changed. Speed reduced to 1.4 from 2. -The icons are properly centered.